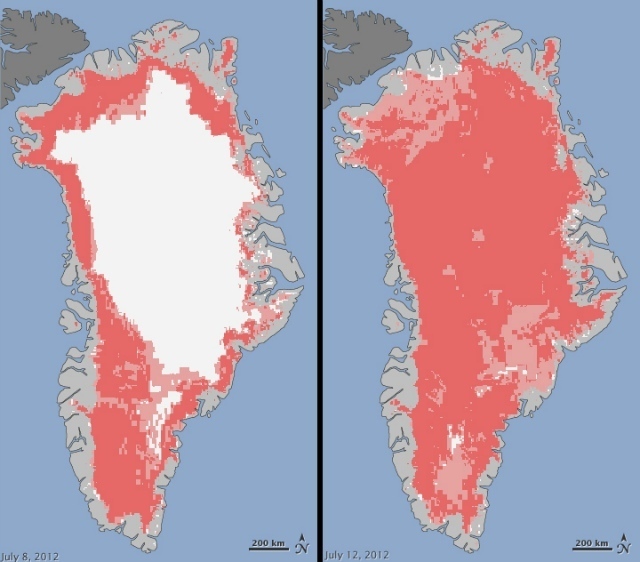 Extent of surface melt over Greenland’s ice sheet on 08 July 2012 (left) and 12 July 2012 (right), melting shown in pink: Jesse Allen, NASA Earth Observatory and Nicolo E. DiGirolamo, SSAI and Cryospheric Sciences Laboratory Satellites recorded an unprecedented rate of ice sheet melt in Greenland this month. Over the course of four days in July virtually the entire surface melted—an area larger than at any time in more than 30 years of satellite observations. On average about half the surface area of the ice sheet melts in summer. 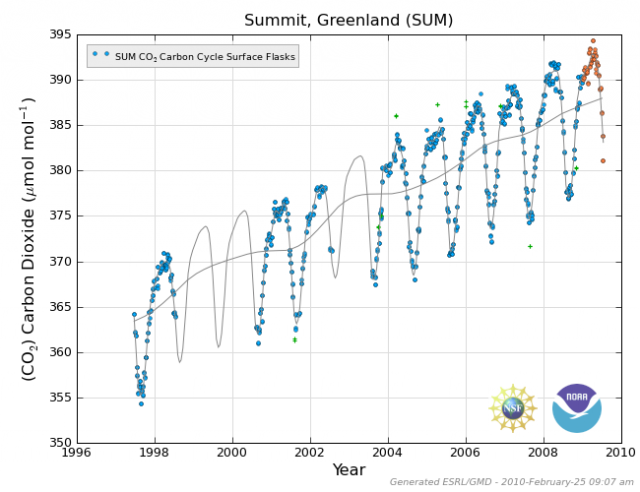 But between 08 and 12 July 2012 the melt spread from 40 percent to 97 percent of the Greenland ice sheet. A researcher at NASA’s Jet Propulsion Laboratory in Pasadena was analyzing radar data from the Indian Space Research Organisation’s (ISRO) Oceansat-2 satellite last week when he noticed that most of Greenland appeared to be melting. The extreme melt coincided with a heat dome over Greenland—one of a series of unusually strong ridges of warm air dominating Greenland’s weather since May. Each successive ridge has been stronger than the previous one this summer. Even the NOAA observatory Summit Station in central Greenland—2 miles (3.2 kilometers) above sea level and near the highest point of the ice sheet—showed signs of melt. Such widespread thawing has not occurred since 1889, according to ice-core analyses.